It’s freezing here in Ireland! The normally green Irish soil is covered in snow and ice, yet the sun shines brightly all day. It’s a magnificent winter wonderland. 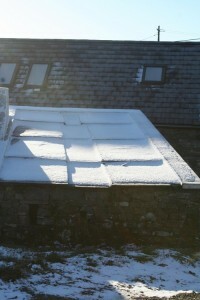 This is a picture of a friends shed with a unique roof made of Liscannor stone. This is a specific stone quarried in North Clare and there aren’t that many topping these beautiful stone sheds anymore. It’s time to stay warm and start baking for the holidays. At the Boghill ctr. 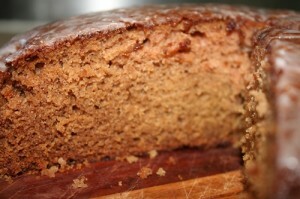 I made this delicious Applesauce Cake from their own apples. It’s a perfect Christmas cake as it has the flavors of nutmeg and fresh ginger. I made it gluten free and low fat. Using the applesauce cuts down on the amount of shortening necessary to make it rich and moist. Enjoy! Heat your oven to 180 c or 350 f. Grease a 10″ round spring form pan. Line with parchment paper. Blend together 1/4 cup melted butter (or shortening), 3/4 cup honey, 1 cup applesauce and 2 beaten eggs. Sift 2 cups of gluten free flour – I used brown rice flour for this. mix together with 1 1/2 tsp. baking soda, 1/2 tsp. salt, 1/2 tsp. nutmeg. 1 Tbl. fresh grated ginger root, 1/2 cup currants and 1/2 cup walnuts. (last 2 ing. are optional). Slowly add the liquid ingredients and pour into pan. Bake for 40 minutes or until a tester comes out clean. Cool on a wire rack. I made my cream cheese icing from Coming Home To Cook and lightly glazed this cake as it is sweet and dosen’t need much. Cream Cheese Icing Blend together 8 oz. soft cream cheese with 1/4 cup soft butter, 1/2 tsp. vanilla extract and 1 lb. powdered (icing) sugar.